HEAVY-LIFTING: Earth moving equipment busy catching up for lost time on the construction of the runway for Pokhara's new airport. The land for Pokhara’s new international airport was acquired 40 years ago, and has since been used as a pasture for livestock. But as heavy, earth-moving machinery finally start preparing for construction of the terminal building and levelling the ground for the long runway, there is hope in the city of a surge in economic activity. The 200-hectare expanse on the outskirts of Pokhara is fast becoming engulfed by the suburbs of Lekhnath Municipality as speculators buy land along the highway and access road. The east-west aligned runway will be able to handle medium-range airliners and allow direct flights to major Indian and Chinese cities, as well as offer migrant workers from Central Nepal direct access to Malaysia and the Gulf. The project was stuck because of the lack of political will in Kathmandu and controversy over awarding the US$216 million contract to Chinese company CAMC Engineering, with the loan coming from China’s Exim Bank. The price tag was deemed to be double what a similar airport in Bhairawa will cost to build. The first order of business for CAMC is to reinforce the perimeter fence because villagers are still bringing their water buffalo and cattle to graze through holes in the wire mesh. Chandra Kanta Baral and Lok Nath Baral say their families have used the field for grazing since their childhood days. But they are happy there is going to be a modern airport in their neighbourhood. Chandra Kanta Baral and Lok Nath Baral have used the area to graze livestock since they were children, but are happy they will now have an airport in their backyard. Two water tank trucks are driving around the site 12 hours a day, spraying water to reduce dust, and engineers say they want to make sure there is minimum disruption and harm to the environment from the construction. The 2.5-km runway design is already visible on Google Earth, some 3km east of the existing domestic airport. The safety area at the east end of the runway had been built up 3m in order to level the ground within a month after construction began. 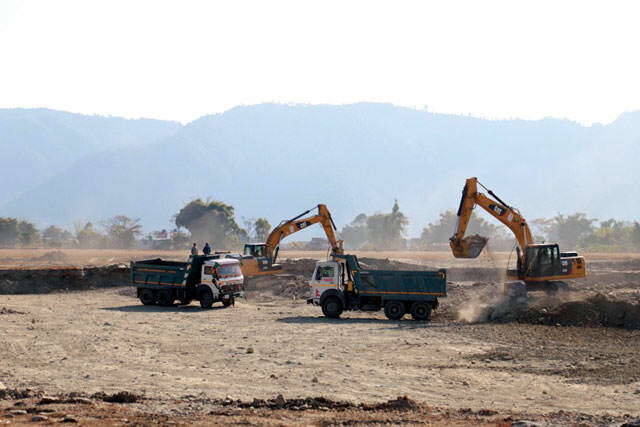 “The team is now working to flatten the ground and is expected to finish 80% of earthwork before the monsoon,” says Krishna Chapagain of CAMC Engineering, which will focus on the runway and terminal building construction after the monsoon. Other infrastructure, like workers’ accommodation and a transformer room, are being built in parallel with the runway and taxiway work. 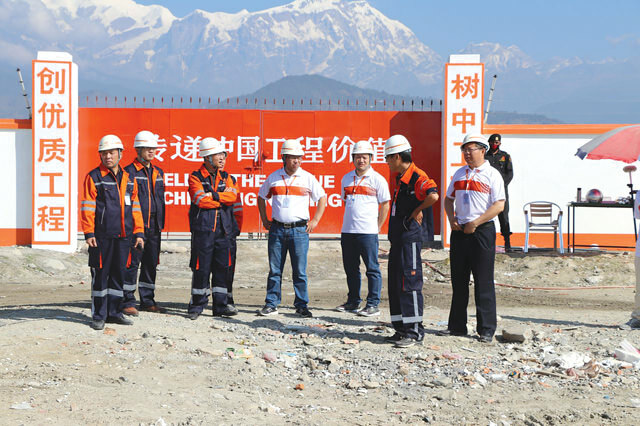 “Some camps have already been set up for more workers during the peak season,” says a Chinese contractor. There are already 36 Chinese (see box) and 150 Nepalis working on the site, and this will grow soon to 100 Chinese and 600 Nepalis. The Civil Aviation Authority of Nepal (CAAN) spent its own money to acquire land from local villagers and relocate them, but the agency says it hasn’t received the compensation yet from the government. Chapagain indicates it is in the process and will be done soon. The Chinese are hoping that the CAAN can smoothen any possible future problems with locals about compensation. But the main challenge for now is to bring in the 40 earth movers needed for construction, which are currently at Birganj customs. According to the agreement, 75% of the total loan will be provided by China’s Exim Bank at 2% annual interest while 25% will be interest-free. Chinese officials told Nepali Times there is a possibility that part of the loan could be converted into a grant in future if construction and bilateral negotiations go smoothly. People in Pokhara spent four long decades waiting for an international airport to be built, but even after China’s EXIM bank agreed to finance the US$216-million project two years ago construction could not begin. Work was stuck because China’s CAMC Engineering Company, which has the contract, cannot get working visas for its skilled and semi-skilled staff. The company has applied for 150 visas, but the application is tangled in bureaucracy, slowing progress in construction. “Bringing in foreign workers to Nepal is like moving a mountain,” says June Zhu, executive manager of the CAMC. Last October, CAMC brought 36 Chinese technicians on three-month tourist visas, which are expiring soon, and the company’s efforts to convert them into working visas are delayed by Nepal’s corruption-ridden immigration service. Chinese companies are involved in two airport projects, several hydropower and irrigation schemes in Nepal and need specialised workers. But because of delays, the workers are forced to work on tourist or business visas. Since not many Nepalis are trained to fly ultra-lights, Gautam brought in three foreign pilots. One of them, Turkish pilot Sprhat Basim, finally got a three-month working visa, which expired recently and he is facing hassles renewing it. Foreigners cannot apply for a labour visa directly at the Immigration Department. They need to apply at a line ministry, which forwards the application to the Home Ministry and then on to the Labour Ministry. Only when the Labour Ministry gives its nod, does the Immigration Department approve the application. Most foreigners choose to work illegally in Nepal because they are not prepared to make illegal payments to have their visas processed. A report by the Labour Department says around 50,000 foreigners, excluding Indians, are working in Nepal, mostly in the service and construction sectors. Only 20% of them are on working visas.